On April 24th, Apple announced results for the company's 2nd fiscal quarter ended March 31, 2012. For the quarter Apple reported revenue of $39.186 billion and earnings of $12.30 per fully diluted share. These results represent year-over-year revenue growth of 58.9% and eps growth of 92.2%. Apple's results for the March quarter exceeded Wall Street estimates by a country mile and in after hours trading the shares retraced recently lost ground and closed the session above $600. Apple has transformed from being the maker of individual product lines to a purveyor of an integrated device and services eco-system. The March quarter results demonstrate the company's growing global dominance of the both the smartphone and emerging tablet device markets while extending Apple's leadership in offering a broadening array of content for these devices. I've titled this article Apple's March Quarter Results: The Good, The Bad and The Irrelevant. I'd like to take each of these qualifiers in turn. In the March quarter Apple sold 35.064 million iPhones, representing an 88% year-over-year increase in units sold. The iPhone gained market share among subscribers at Verizon and AT&T despite the sequential decline in domestic iPhone sales. 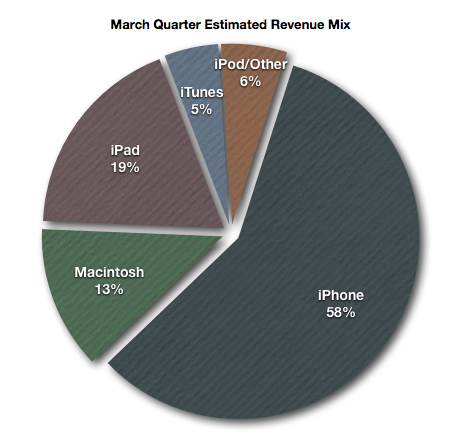 In the March quarter, Apple shipped 11.798 million iPads, representing 151% year-over-year unit sales growth. Apple's Asia-Pacific Region delivered 114% revenue growth based on strong demand for the popular iPhone 4S handset with ongoing product demand. The revenue segment inclusive of iTunes delivered 32% revenue growth to $2.151 billion and the revenue total exceeded revenue from iPod sales by 78%, signaling while the iPod line continues its decline, Apple's revenue generated from content sales and services for iOS-based devices continues to rise. Last fall I dubbed Apple's December quarter "The Monster Quarter". The company's December quarter performance lived up to the name. In the 14-week period ended December 31, 2011, Apple reported recognized revenue growth of 73.27% to $46.333 billion and eps growth of 115.71% to $13.87. Today I am calling the company's March quarter "Apple's Monster Quarter - The Sequel." For the 13-week period ended March 31, 2012, I am estimating reported revenue of $44.028 billion and earnings per share of $13.15, representing anticipated revenue growth of 78.49% and eps growth of 105.47%. The chart below illustrates my estimated revenue mix for the March quarter. I expect the Apple iPad and iPhone to represent 77% of the reported revenue in the quarter and for the iPhone to be the primary product in determining the quarter's revenue growth, gross margin and eps outcome for the period. On April 24th Apple will announce results for the company's 2nd fiscal quarter ended March 31st. To gauge expectations for the March quarter, we asked members of the Braeburn Group, formerly known as the AAPL Independent Analysts, to submit estimates for the company's March quarter performance. The group takes its new name from the braeburn apple, a hybrid cultivar of the popular fruit. Among the fifteen Braeburn Group members who submitted estimates for the March quarter are Dennis Hildebrand, Navin Nagrani, Patrick Smellie and newcomers Scott Millar and Christian Peel. Collectively these fifteen individuals represent a cross section of the Group's members and come from a variety of professional backgrounds and career interests. Membership in this private group is open to those willing to register and actively participate in the group's lively discussions. Mac Sales: In Apple's 14-week December quarter, Mac unit sales rose 25.74% to 5.198 million units. The average unit sales growth estimate from the Braeburn Group Index participants suggests unit sales growth of 22.80%, on track with the 22.19% unit sales growth Apple reported in in the fiscal year ended last September. iPhone Unit Sales: On average, the Braeburn Group Index participants expect iPhone unit sales growth of 105% to 38.232 million units. This is below the December quarter unit sales growth pace of 128% and slightly above the FY2011 unit sales growth rate of 99%. iPad Unit Sales: The introduction of the new iPad in the final month of the March quarter has produced a wide range of unit sales estimate from the Braeburn Group Index analysts. For the quarter, the fifteen participants anticipate on average unit sales of sales of 13.301 million iPads and associated unit sales growth of over 183%. iPod Unit Sales: On average, the index participants anticipate a nearly 25% decline in year-over-year iPod sales to about 6.845 million units.